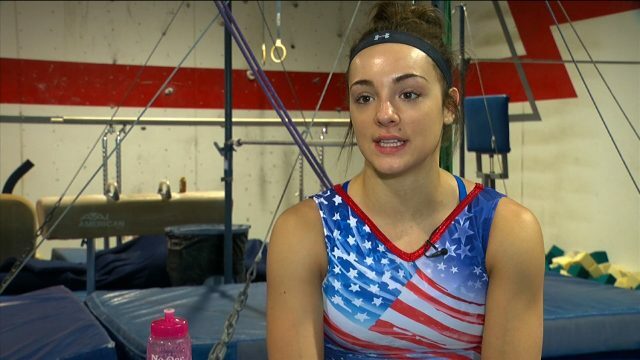 American gymnast Maggie Nichols claims she was the first to report sexual abuse by Larry Nassar to USA Gymnastics and has slammed the national governing body for not responding quicker or doing more to prevent him from assaulting more young women. The 20-year-old has identified herself as “Athlete A” in the case against Nassar and said the team doctor molested her at the Karolyi Ranch Olympic training camp in Texas when she was 15. In an open letter, Nichols announced she would be joining her former team-mates Aly Raisman, McKayla Maroney and Gabby Douglas in stepping forward to speak out against Nassar. “Recently, three of my friends and former national team members, who medalled at the 2012 Olympics, have bravely stepped forward to proclaim they were sexually assaulted by USA Gymnastics team physician Dr. Larry Nassar,” she wrote in her statement. “I am making the decision to tell my traumatic story and hope to join forces with my friends and team-mates to bring about true change. “Up until now, I was identified as ‘Athlete A’ by USA Gymnastics, the US Olympic Committee (USOC) and Michigan State University. Nichols, who was a contender for the Rio 2016 Olympic team before being sidelined by a knee injury, wrote that she was experiencing back pain when Nassar began molesting her. “I trusted what he was doing at first, but then he started touching me in places I really didn’t think he should,” she wrote. “He didn’t have gloves on and he didn’t tell me what he was doing. “There was no-one else in the room and I accepted what he was doing because I was told by adults that he was the best doctor and he could help relieve my pain. “He did this ‘treatment’ on me, on numerous occasions. “Not only was Larry Nassar my doctor, I thought he was my friend. “He contacted me on Facebook complimenting me and telling me how beautiful I looked on numerous occasions. “But I was only 15 and I just thought he was trying to be nice to me. In 2015, Nichols’ coach overheard her talking about Nassar’s treatments to a team-mate. “After hearing our conversation she asked me more questions about it and said it doesn’t seem right,” she wrote. “I showed her the Facebook messages and told her about what Nassar was doing. Nichols said she had found out that Michigan State University had ignored complaints against Nassar from other girls going back 20 years and had investigated him for sexual assault in 2014. “They never told USA Gymnastics,” she added. USA Gymnastics has praised Nichols for coming forward and claimed that contrary to reported accusations, it never attempted to hide Nassar’s misconduct. “USA Gymnastics reported Nassar to the FBI (Federal Bureau of Investigation) in July 2015 and to a different FBI office again in April 2016,” a statement reads. “When Maggie’s comments were relayed by her coach to the organisation, USA Gymnastics immediately contacted her parents and hired an experienced, independent investigator to speak with her and others at a mutually agreed date and time. “The information that Maggie and later a second athlete provided was important, but did not provide reasonable suspicion that sexual abuse had occurred. “Following a third athlete interview on Friday, July 24, 2015, the investigator recommended that USA Gymnastics report to law enforcement, and USA Gymnastics contacted the FBI on the next business day, Monday, July 27. “When USA Gymnastics representatives met with the FBI on Tuesday, July 28, 2015, they disclosed the information received during all three interviews, including Maggie’s. “The FBI then took over the matter, and it decided who to speak with and when. “USA Gymnastics cooperated fully with the FBI, including the agents’ July 28, 2015 request to not do anything that might interfere with their investigation. Last month, Olympic gold medal-winning gymnast Maroney filed a lawsuit against Michigan State University and the USOC, alleging that the institutions “failed to properly investigate” Nassar. He was given 20 years for each count and has also been charged with molesting seven girls during his time with USA Gymnastics, for which he will be sentenced separately next week. According to The Wall Street Journal, Maroney was paid $1.25 million by USA Gymnastics in 2016 to keep silent on Nassar’s abuse. This was while she was member of the national gymnastics team and the Olympic team for London 2012, where she was part of the US’ women’s artistic all-around team that won a gold medal.